TJ's Feathered edge fence panels are made from feathered edge boards which overlap each other and for additional strength the framing is divided into four. Covering an area of 19ft the pressure treated feathered edge fencing pack @ 3ft high consists o.. Covering an area of 25ft 3" the pressure treated feathered edge fencing pack @ 3ft high consist.. Covering an area of 31ft 6" the pressure treated feathered edge fencing pack @ 3ft high consist.. Covering an area of 37ft 9" the pressure treated feathered edge fencing pack @ 3ft high consist.. Covering an area of 44ft the pressure treated feathered edge fencing pack @ 3ft high consists o.. Covering an area of 50ft 3" the pressure treated feathered edge fencing pack @ 3ft high consist.. Covering an area of 56ft 6" the pressure treated feathered edge fencing pack @ 3ft high consist.. Covering an area of 19ft the pressure treated feathered edge fencing pack @ 4ft high consists o.. 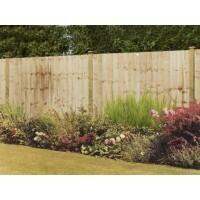 Covering an area of 25ft 3" the pressure treated feathered edge fencing pack @ 4ft high consist.. Covering an area of 31ft 6" the pressure treated feathered edge fencing pack @ 4ft high consist.. Covering an area of 37ft 9" the pressure treated feathered edge fencing pack @ 4ft high consist.. Covering an area of 44ft the pressure treated feathered edge fencing pack @ 4ft high consists o.. Covering an area of 50ft 3" the pressure treated feathered edge fencing pack @ 4ft high consist.. Covering an area of 56ft 6" the pressure treated feathered edge fencing pack @ 4ft high consist.. Covering an area of 19ft the pressure treated feathered edge fencing pack @ 5ft high consists o..